Deer season is in the rearview mirror and all that remains is some venison in the freezer and the memories of your hunt. While the hunting season is over, it is important to remember some post season maintenance on your tree stand. A good tree stand is a significant investment, so it is important to take care of it, and that starts with a thorough inspection and repair effort once the season ends. Some hunters leave their hang-on tree stands up all year, but this subjects your stand to brutal weather conditions and can result in significant damage to your stand. 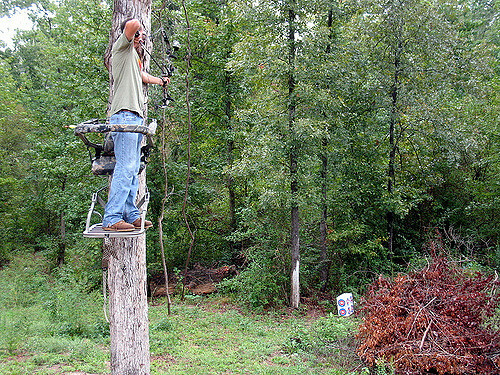 Your best bet is to remove the stand immediately after the season ends and bring it home. The most important items to inspect on your tree stand are the straps and cables, because they can be a safety issue. Any damaged, frayed or broken straps or cables should be replaced. Failure to do so can result in serious injury the next time you use it. In addition to the straps and cables, it is important to check the stand’s ratchets, pins and S-hooks to make sure they are in good condition and working properly. Any worn or stressed parts should be replaced. You should also check all the bolts on your tree stand to make sure they are tight. Any rusted or damaged bolts should be replaced with new ones. Rust is one of the biggest problems that affect tree stands. Your inspection should include a search for rust on your stand. If you find some, thoroughly sand; then prime and paint the area. This will help keep your stand in top condition and protect your investment. A good tree stand seat can be a deer hunter’s best friend, so you want to keep your seat in top condition. If your seat has any rips or holes, repair them, so they do not become worse. If your seat is worn beyond repair, this is a good time to order a new one. To best protect your seat during the offseason, it is recommended to store it in a sealed, waterproof bag. It is important to thoroughly clean and dry your tree stand before you pack it way for the season. Remove all dirt, grass, sticks or other items that may have collected on your stand during your hunts. To protect your stand from moisture during the offseason, store it in a sealable plastic container. If you have a permanent deer stand or structure that is up all year, this is an excellent time to get out and inspect it for needed repairs. Replace rotted boards, tighten bolts and check for any other safety issues that may be a concern. Making repairs now will help ensure it will be ready for next fall.